origins met the primary criteria for future exaltation. They were humble, poor, and hard working. computer was very new at the time; many people didn’t think there was a use for a computer at home. The lesson: When you’re introducing something new, keep it simple. Apple opens the brochure with the above quote, providing social proof from buyers. This was a campaign in which anyone could submit an essay answering the following question: “What in the name of Adam do people do with Apple computers?” The best writer would win a trip to Hawaii, “the closest we could come to paradise.” Always solicit feedback, and don’t be afraid to launch weird contests. 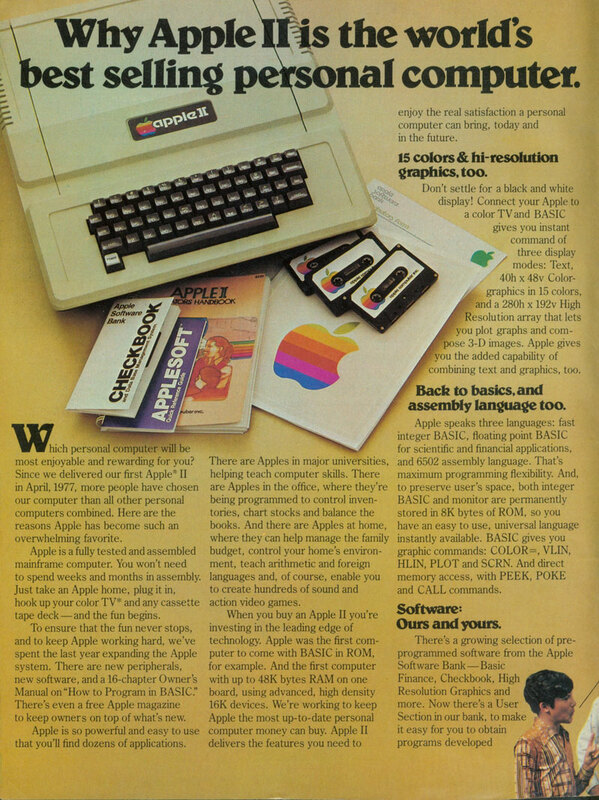 The ad depicts Benjamin Franklin designing a kite on the Apple II. If there is a reputable national or historical figure from history you can tie your product to, do it. This ad was radical for the time. Apple introduces the idea to millions of housewives that the computer can empower them to work (even if others in their life aren’t so supportive of that). Don’t be afraid of tackling hot button issues if your intentions are good, and your product or service can help give people new opportunities. This commercial features clips of people around the world using Apple computers. Apple was one of the original pioneers in promoting a diversity of people, and ideas. Apple introduces the Lisa, “the first personal computer” for the office. If you were the first mover with a product or service, tell everyone about it. Apple introduced the first Macintosh during the Super Bowl with a vision inspired by George Orwell’s 1984. The Apple team hired Ridley Scott to direct this TV spot. And it packed a powerful CTA: On January 24th, Apple computer will introduce Macintosh, and you’ll see why 1984 won’t be like “1984”. After 1984 worked so well, Apple decided to double down on what was working and created, “Lemmings”. Ridley Scott’s brother directed it, and instead of showing people as drones, it went way beyond and depicted a mass suicide. Yikes. The ad bombed. Many people were fired our ousted, and Steve Jobs left the company a year later. The lesson? Be a bit radical with your ads, but don’t insult people. One of Apple’s first slogans was “The Power to Be Your Best”. It’s a powerful reminder to distill your message into what your product or service helps people do. and the commercial zooms into show the salesman’s badge (he’s from IBM!). The commercial ends with a Macintosh logo. If you need to make sales, you need to create a campaign (or content) that will help your sales teams sell. In 1985, Steve Jobs left Apple. The next year, he acquired Lucasfilms struggling animation division called Pixar. One of their first sales and projects was a commercial and collaboration with Apple to promote the Macintosh II. The lesson? Sometimes those who have been ousted from the company have the best ideas about how to improve it. This ad was about striving to create a new market for portable computers. The Macintosh Portable was sixteen pounds and cost $6,500, and never took off. But it did introduce the idea that one day computers would be portable. The lesson? If you want to create a new market, beware of being too early, and you might have to start advertising it decades in advance. Up until this point, colored computers were incredibly expensive. This was the first affordable Mac with a color display. This ad embodies the principle of keep it simple. Out of Reach introduced the Macintosh Classic II. Most people at the time didn’t know that prices were falling for computers or that you could use them at work. So, it depicted a business person snatching a computer off the ground from his motorcycle on the way to work. The lesson? Pick the broadest misconception that’s stopping people from trying your product or service. Use video to erase that misconception and show them how easy trying your product or service could be. This ad showed two businessmen using PowerBooks in an airplane at 30,000 feet. The lesson: how early adopters and trendsetters are using your product or service might be the most interesting thing your ads can depict. creations with no images, and after shows them with beautiful color photos. The ad introduces the Apple Quick Take, one of the first consumer digital cameras. The reminder is simple, show what life is like before your product, and what it’s like afterwards. Before, and after. In this ad, Apple takes a central human question and has several influencers answer it. The question: What is power? The lesson: influencer marketing works. Find a macro question your early adopters have, and show them how influencers that speak to them attempt to answer it. Do your best to answer all the questions your early adopters might have. Not just about your product, but about life, too. Fun side note, this ad came out the year after the classic, Power vs. Force. Apple paid for product placement in the first Mission Impossible movie. In this ad, they made it even more clear that they’d done this by collecting all the scenes from the film in which Apple products are shown and used. Product placement works, and if you’re up front about it, you can build and maintain trust with your audience. Albert Einstein, Muhammad Ali, Gandhi, Bob Dylan, and Amelia Earheart. Choose to celebrate or associate with celebrities that are famous because of their substance. If you choose to associate with those who are famous for being famous, or for things they were born with (looks, inherited money), you’ll lose. If you associate with higher qualities (courage, imagination, creations), your ads will be far more evergreen. People will attack you for your audacity, but at least you’re promoting great role models. Fresh off of a direct attack on IBM (Think Different), Apple introduced “Un-PC”. This campaign continued to articulate why it was different from the number one alternative to their product (the PC). Pick out the number one alternative to your product or service. Then show why your product is a better alternative. In the public consciousness, Y2K fears were reaching an all time time. So Apple took the most nefarious computer from movies, “Hal” from 2001, a Space Odyssey. In the commercial, Hal stokes the Y2K fears and says that every computer caused a global catastrophe… except for the Macintosh. Pick out a real fear your potential customers have. Poke fun at it, then show how your product can help assuage that fear. If you help reduce the level of fear someone has, they’ll be grateful for a long time. This ad gets Jeff Goldblum to tell people about iMovie and show people what they can do with the iMac and iMovie. It’s a simple format that reminds people that they can take raw materials that they already have (their home movies) and use the iMovie software to create professional movies. Remind your customers that with your product, they can take something they already have to the next level. Show them going from the raw material to a finished product in a minute. It shows a person dancing to music. The key to this ad is it shows someone who is utterly carefree doing something more people wish they could do without a care… Dance as if no one is watching. If your product or service can help people reach their ideal state, don’t be afraid to show it off. This ad skirts the bounds of political correctness, using two individuals to present the differences in its PowerBooks. The seven foot five Yao Ming advertises the 12 inch PowerBook, while the two eight Verne Troyer advertises the 17 inch PowerBook. Create an image highlighting the differences in your products. If people think there isn’t much of a difference between two of your offerings, they’ll lump them into the same category. If they see them as being different, they’ll seek to understand those differences and learn more about your offering. The iPod was starting to sell well. Apple took the dancing video ad that introduced the iPod, and helped make it more applicable to everyone. It paired different silhouettes with different music from U2, Bob Dylan, The Black Eyed Peas, Mary J. Blige, and Coldplay. By using a silhouette and many different selections of music, Apple increased their chances that people would individually connect with this ad. When you’re out of ideas, or on a tight budget, repurpose an ad from the past. Apple remastered their 1984 campaign, and republished it. trying to get the iPod Nano don’t succeed in grabbing it, and it creates an open loop in the viewer’s mind. Show that your product or service is in demand. your product or service solves a real need, don’t be afraid to tell people to get it. This ad shows thirty some clips from famous Hollywood movies and actors who are answering telephone calls. It culminates by showing the new iPhone. The ad taps into nostalgia and then opens a loop showing how new memories of saying “Hello” might be achieved. It suggests that there is a new way to do something you do every day (answer the phone). The MacBook Air’s most astonishing quality was how thin it was. This ad shows a person taking a MacBook Air out of an envelope that you wouldn’t believe could hold a computer. Pick the one attribute of your product that is most remarkable. Then present it with the right context that helps show how remarkable it is. your product to achieve, and show them being addressed. It brings up the idea that no matter what your question, we have the answer. Wherever possible, show what your thing can do, don’t talk about it. This ad has a song playing in the background while it shows many different ways the iPad can be used. Show, don’t tell. The App Store was revolutionary for software delivery and distribution. As other smart phones began popping up, this ad reminded people that when they had an iPhone, they had access to the App Store. Remind people of features that makes your offering unique. This ad promotes Siri using celebrities like Samuel L. Jackson, Zooey Deschanel, and John Malkovich. Celebrity promotions work. If you can’t go for celebrities, go for micro-influencers. This ad pushed the bounds of what Siri could do, irritating some people. The lesson? Don’t exaggerate or oversell. family Christmas gathering going on all around him. At the end, he shows his family what he’s been preoccupied doing, creating a film with his iPhone to celebrate their get together. to create moments of deep connections… maybe even love. Show how your product or service can be a part of reaching higher ideals like amazing family gatherings. what we know we should be doing. Show how you can help your customers fight that battle. years in 40 seconds. Once you have a backlog of content, show it all off in a remix. This is a satirical video showing what life would be like without all of our apps. Show people what life would be like in the absence of your product or service. could do with a feature of your product. Most people might not get everything out of your product or features that they could. That’s okay, but don’t be afraid to show them what an extreme/fully optimized use case might look like.